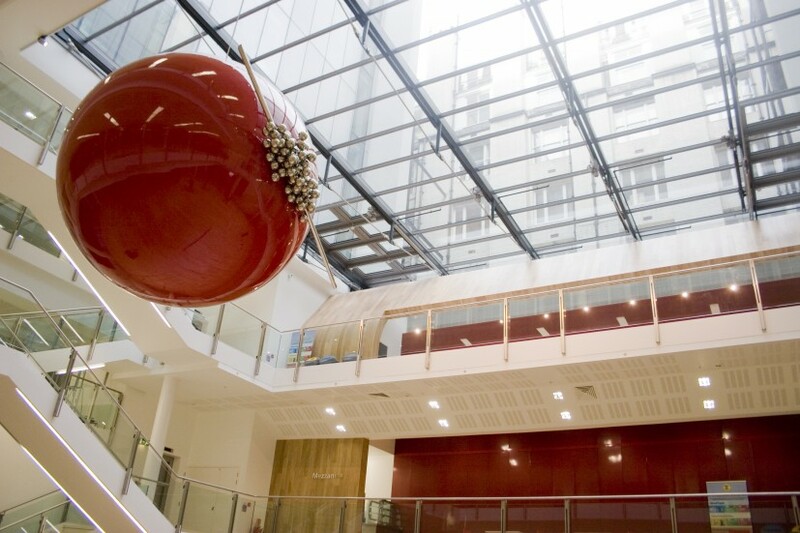 The Contemporary Art Society worked with the LSE to commission two contemporary artworks for the New Academic Building in London; a suspended work for the atrium and a wall-based sculpture for the exterior of the building facing Kingsway. 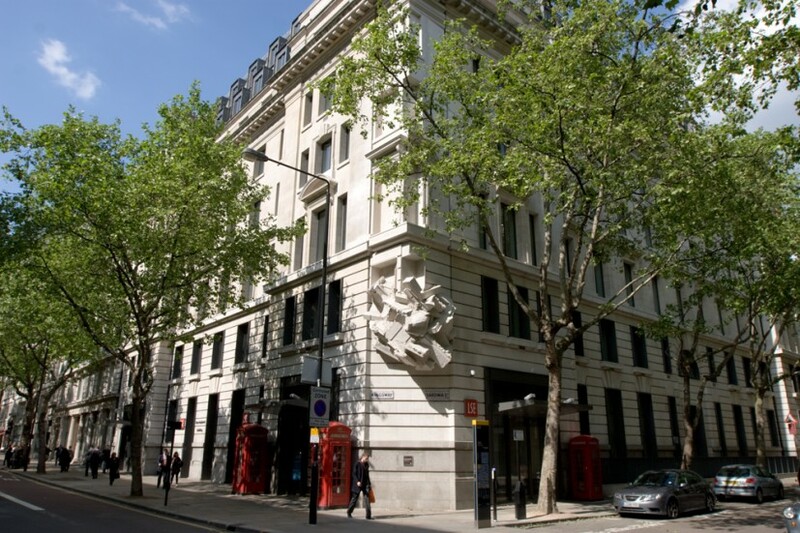 The Contemporary Art Society’s Consultancy team were appointed to the project in December 2006. The selection of artists was an involved and rigorous process, with close involvement from the high-level advisory panel comprising executive, design, faculty and student representatives. Joy Gerrard’s suspended work was completed and officially launched by Her Majesty the Queen in November 2008. The artwork for the exterior by Richard Wilson was unveiled in September 2009. Elenchus/Aporia takes the complex multiplicity of human and societal relationships as its inspiration, mirroring the architecturally determined spatial relations, trajectories and human flows of the building. 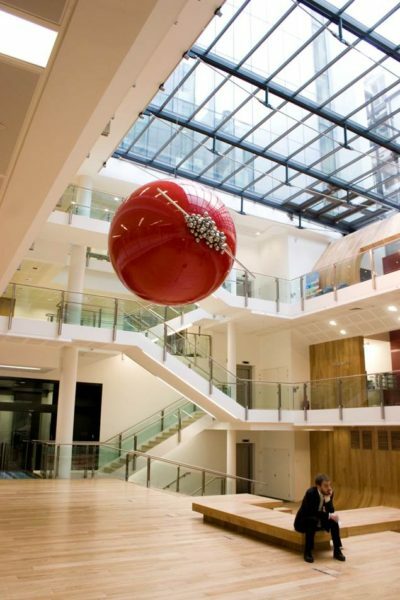 Consciously engaging the educative, discursive and creative character of the LSE as an institution, two separate but interrelated installations are positioned within the Atrium and beside the lift. The giant globes represent major economic or political concepts, echoed around the atrium in smaller constellations of glass and steel that suggest the linguistic relation between a formal utterance or statement, and how ideas travel, prompting meaningful debate. 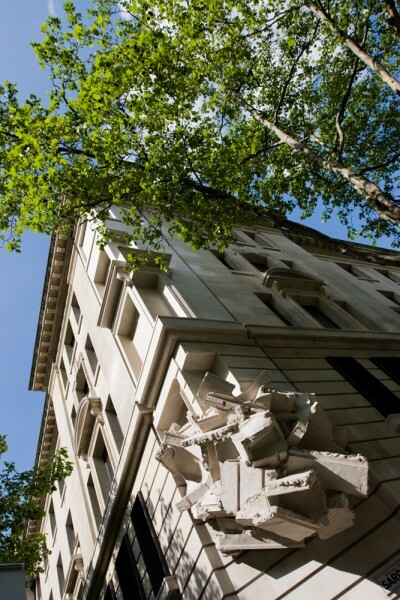 Curated by the Contemporary Art Society for the LSE, the work commemorates the new building as a symbol of knowledge and creative thought. Known for his architectural interventions such as Turning the Place Over for the Liverpool Capital of Culture, Richard Wilson’s proposal for the exterior of the New Academic Building provides a subtly humorous addition to the architecture. Square the Block is a sculptural feature attached to the corner of the building. The feature on inspection is a fake, a manufactured corner where previously there was just a chamfered edge to the building. The sculpture’s two sides have been copied from selected vertical areas on the existing building, that when placed together make no architectural and functional sense other than completing the corner. The work stops short of the ground at about the first floor. Here the corner appears to be compressed as if by a giant intervening force from below, giving the sculpture a pliable and witty answer to freeing up the walkway.